Chanel Diamante is the next trend in fashion. It was first introduced in Chanel earrings, but because everyone was crazy about it, now the Diamante design is also implemented in handbags. 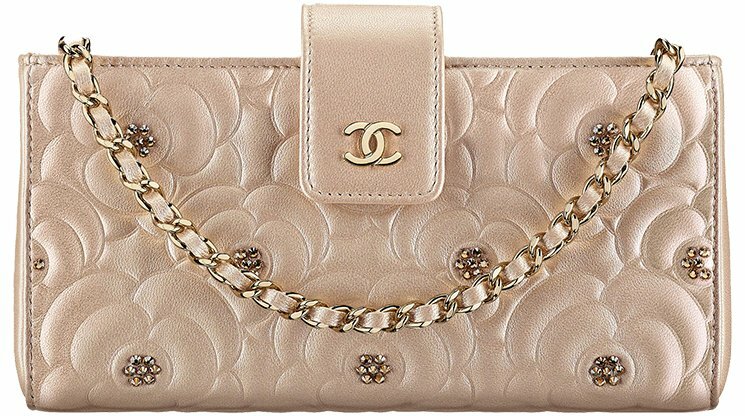 Previously we’ve talked about the Chanel Diamante Camellia WOC and the Diamante Camellia O Case. Today we’re going to chat about the Diamante Clutch with Chain, which has been released for the Fall Winter 2017 Collection. The Clutch with Chain is a not a new bag, there were multiple editions released in the past. For example; the Velvetand the Python versions. The implementation of the Diamante Camellia design gives this mini shoulder bag a new look. It’s chic’er, more sophisticated and ladylike. The Clutch with Chain is smaller than the WOC, but its still a lovely evening bag (or for day when you don’t feel like carrying much). It’s also slightly less expensive than the WOC. The Diamante Camellia is gorgeous; The Camellia flower has been embellished all over the bag while the stigma is refined with little diamante-like stones. The rectangle shape is very cute and it features the signature woven chain leather strap for shoulder or cross body carrying. The front is also designed with a leather strap, crafted with the iconic smooth CC logo on it. The front leather is made as an extra security, but also for decorative purpose. To open the bag, you need to zip it open on the top. Inside you will find one large compartment to store your basic essentials/or evening essentials. Style code: A84268, measuring 3.7’ x 7.3’ x 1.6’ inches, priced at $1850 USD, €1850 euro, £1600 GBP, $2840 AUD, $14900 HKD, ¥14600 CNY, ¥231120 JPY, 9200 MYR via Chanel boutiques.